Ladies Sharon Pure Cotton Blouse in a feminine striped design. Very good fabric, nice fit. Good colours. I am very pleased. "Very good fabric, nice fit. Good colours. I am very pleased. " 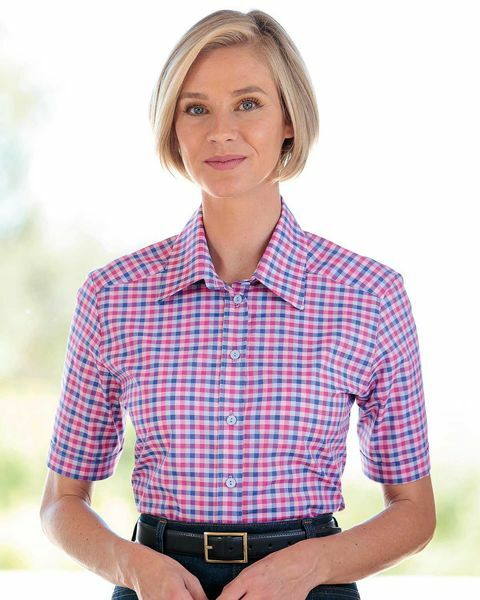 Ladies vibrant pure cotton check design blouse in shades of cyclamen, cobalt and pale blue. Short sleeved style with mock turn back sleeve hems , straight hem and side vents. With classic tailoring and a feminine check this blouse is a wardrobe essential.